Here at the Ice Cream Dream Tricycle Hire only the best quality ice cream bicycles will do. We use Pashley bicycles for our ice cream hire service. Pashley are England’s oldest cycle manufacturer making hand-built British bicycles since 1926. 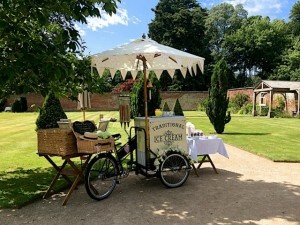 For our ice cream hire service we use Pashley’s Classic No.33 ice cream tricycles. The Classic No.33 is a key part of Pashley’s heritage and with its unbeatable hand-built craftsmanship, it has proven to be practical, eye catching and beautifully designed with attention to detail for our ice cream bike hire service. Our black framed Classic No.33 ice cream tricycles are built with modern components including a rear hub brake, twin front calliper brakes and a parking brake which means dependable all weather stopping power and steady parking for our ice cream tricycle hire service. All of this ensures that our ice cream hire tricycles stay stationary when parked giving both ourselves and our customer’s peace of mind that our ice cream hire bicycles are not going to move once parked. Our ice cream hire tricycles also have a unique three-wheeled design with robust multi-surface tyres with extra puncture protection and reflective side walls. Therefore the ice cream hire tricycles have hard wearing tyres with secure tread design and an inner SmartGuard layer which means that our ice cream hire bikes have extra puncture protection and resistance to shards of glass, nails and pins. The Classic No.33 ice cream bicycle has a large front load platform to hold our beautifully wrapped ice cream hire freezers. Our ice cream bicycle hire freezers are manufactured by Tefcold. The freezers are the latest in mobile ice cream bike freezer technology and give us the confidence to do a full day’s trading with our ice cream bicycles once charged. The frame on our ice cream hire tricycles have been designed specifically for industrial use, hand built using 100 year old traditional methods. Our ice cream tricycles have an integrated column-pivoting handlebar and umbrella mounting clips to allow us to use different coloured parasols on our ice cream hire bicycles which adds to its unique and quirky design and allows for visibility as well as sun / rain protection whilst out on our ice cream hire tricycles. All the frames on our ice cream hire bicycles have a durable powder-coat finish with corrosion resistant hi-zinc base coat. The ice cream tricycle frames are hand painted and you will notice that all of our ice cream hire tricycles are black in colour. They are given an oven-baked powder-coat that gives a durable and vibrant finish to our eye catching ice cream hire tricycles. Our ice cream hire tricycles also have a traditional Brooks B33 leather sprung saddle. The B33 model was originally launched in 1938 and is the only Brooks saddle to still feature front loop springs. Our ice cream hire tricycle saddle also has handy rear luggage loops. The saddle looks very classy on our ice cream hire tricycles and many people comment on the style, strength and durability of it. The leather allows the saddle to breathe and form a shape that makes our ice cream hire bicycles very comfortable to ride. We think the Brooks B33 saddle is a beautiful addition to our lovely ice cream hire bicycles.